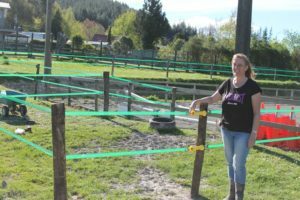 I am totally blown away by the amazing fencing products supplied by EquiSol NZ. Not only did Bill and Kym personally deliver my order, they then showed me how to erect it by completing one whole area and outside pen. The scary bit came when I had to repeat what I had been shown under their watchful eye – I think I passed! Bill and Kym are very patient to ensure that you fully understand the fitting process – but how simple and quick to erect, yet how extremely effective and strong the fencing is – not to mention remarkably affordable. Five star rating from me, and no more thin tape for my precious horses. A huge thank you to Kym and Bill for taking the time to come out and show me, amazing customer care. I have a troublesome horse, who i could not keep in, behind my electric fencing. Everyday Zorro would get out of his paddock. Since putting up your electric fence system, Zorro has remained behind the tape. Thank you for this great, easy to put up system. I recently purchased EquiSol fencing for approximately 20 acres to be split into 6 paddocks. I have started installing it and have found it very simple to use. I had the fence posts installed professionally and all I’ve had to do is attach connectors with a screwdriver and clip on the tape. It’s great that I’m able to do it on my own. Traditional fencing would require a man to help so this is a great solution for all us horsey girls. I have 4 horses and not one of them will touch the fence. This is really helpful as my grey would charge through the thin white electric fencing and now he is safely and securely contained! Additionally, it has proved to be more economical that I had anticipated. This is a great product I wouldn’t hesitate to recommend.